This past month Kobey, Shawn, and Zomawia went to the Intel University Showcase at GDC, representing as AIE alumni. We didn’t get the judges’ attention but the people who played Buoyancy liked it, so we got that going for us which is nice. The Discord channel has been growing. 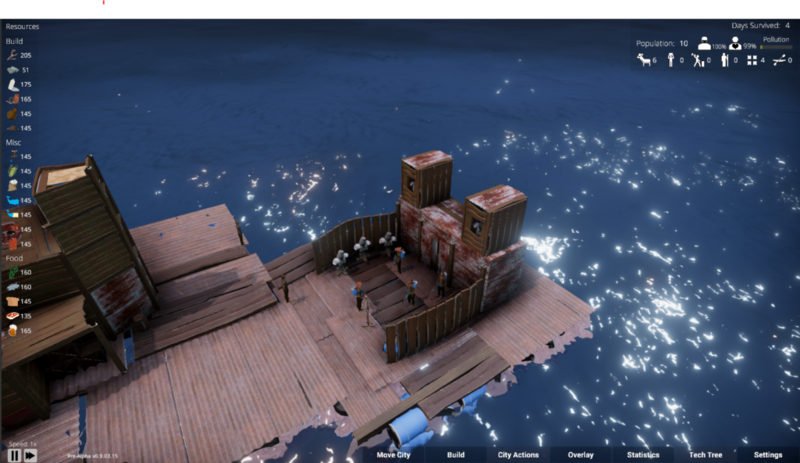 Come join and chat with the community, ask the devs some questions, and make some Waterworld references. Also going on this past month was our first playtesting sessions. Before you ask it’s private and invite-only. We got some feedback on gameplay, confusions, frustrations, etc. which will help us build a better game. New icons for the items of the game since they needed to be looked at again. all painted in Krita. More game balancing has reshaped Buoyancy. We found that the rate of births grew faster than the amount of resources could be gathered or produced. To compensate, instead of reducing reproduction rates (yet) we increased the rates of gathering and production, slightly reduced the quantity of resources gathered and produced, and increased the required costs of construction and production. Thus far, this has created a better balance of building activities and idle villagers. As testing continues, these values will likely change. We implemented City Statuses to help display when something is going wrong in your city. They will appear next to notifications and provide information on what is going wrong in your city and how you can fix it. I changed the water again. I’ve wanted to have Gerstner waves (realistic ocean waves) in Buoyancy for a while, but I was never able to get them to be tileable so we’ve been sticking to sin wave displacement. I finally got a Gerstner shader that was tileable by trimming the wave displacement on the outer vertexes of the mesh to allow them to snap together. I’ve redesigned our Settings menu to look less like a Flash game from 2008 and more like a Flash game from 2019. Also I redid the whole overlay and notifications on the buildings so there’s not 1000000 floating text boxes hovering over your city. Now when you hover over a building you get all that juicy information goodness. When you hit the overlay button it shows a radial progression meter for whatever resource the building is producing. Building Status has been replaced with icons. Clicking on the building shows you what the status is. It is intended for the player to eventually learn what the icons mean so they don’t have to click/hover the building. It was noted by some playtesters that there appeared to be some noticeable performance spikes that happens during a playthrough. Some of these were caused by inefficient particles and other effects. To relieve these issues, I went through all our current effects and made them more performant. While this has helped, we are still monitoring for further issues if any more should arise. 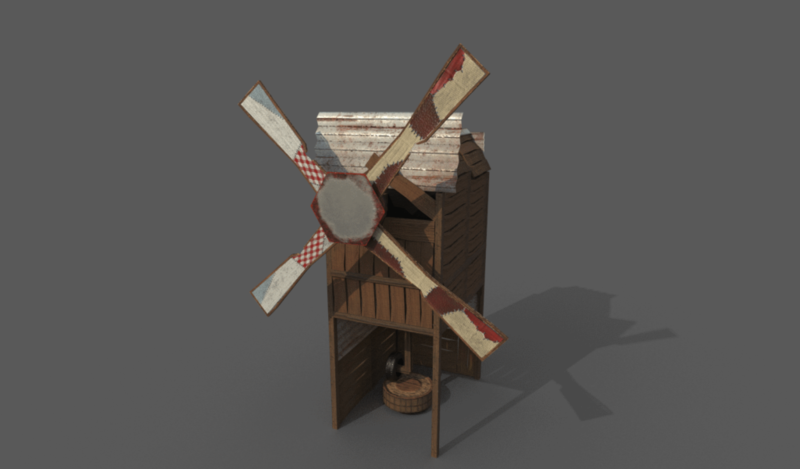 The mill has gotten a bit of an update to help it stand out among the other buildings in the game. I’ve been experimenting with texture work for the villagers we have in-game. 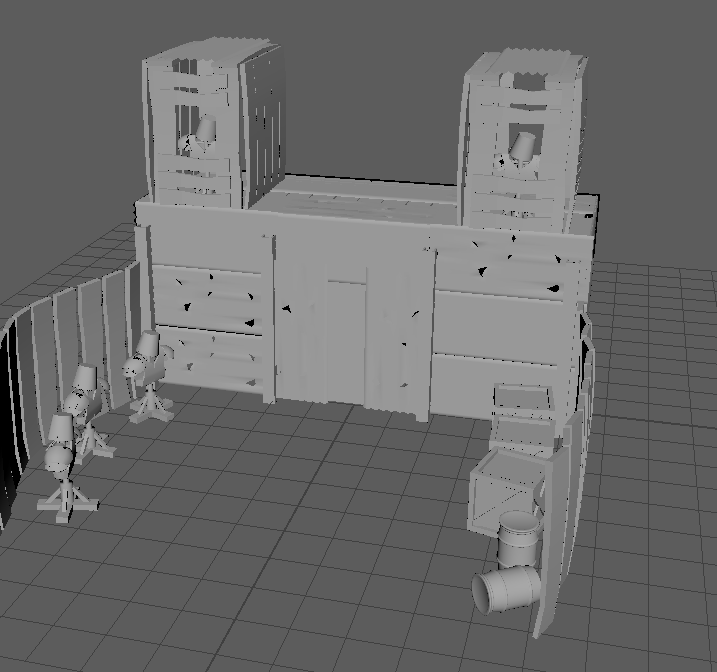 So I wanted to take a little break from them to improve one of the current buildings. The change in fabric on the mill give the blades to seem more scavenged but also allowing the colors to not clash too much around each other. Buoyancy now has it’s own custom shaders for all our buildings which includes their own custom lighting. I used a standard PBR lighting model for the shader so that we could have a more customized look for the game instead of the default engine shaders we were using. Made a breach animation for the whale. And sort of jumbled up the animations into a FSM to make it react to the player’s city. Now the whale has to be hunted down (by Harpooners) before you can harvest it (by Harpooners). Keep up the great work. It sounds like the game is getting better better.